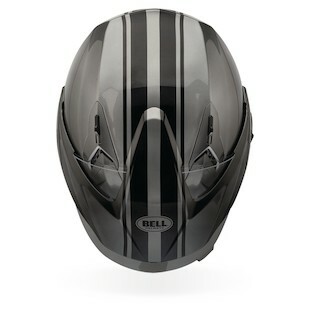 The brand new Bell Mag-9 Helmet is the aggressive successor to the Mag-8 3/4 helmet. This helmet is built for a variety of riding scenarios, from long-distance touring to cruising to scootering and urban light motorcycling. Designed of a lightweight yet resilient polycarbonate shell, the Bell Mag 9 Helmet features three EPS sizes to minimize material, but maximize comfort and protection. The Bell Mag-9 is DOT certified and features a laundry list of upgrades over its predecessor. Bell has added intake and exhaust vents to create the trademarked Velocity Flow ventilation on Bell Helmets, which makes this one of, if not the, most ventilated open face helmets on the market. The interior is removable and washable and there are all new cutouts for speakers making installation of your bluetooth communication a cinch. Check out our detailed video review some photos of the brand new Bell Mag 9 below. can you tell me the shape of the mag-9, does it retain the intermediate oval shape of its predecessor, the mag-8.. This helmet stoles my heart I want to know how much it cost. @grumpymacc We actually find the Mag-9 to be a slightly more neutral fit than the Mag-8. It leans a bit toward the rounder side of the spectrum.